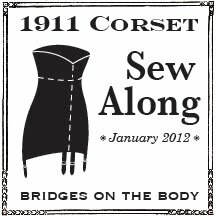 Welcome to week four of the 1911 corset sew along! Your pattern may be a mish-mash of taped paper scraps by now, mine is. One could trace it on new paper or card stock. I rarely do this. A pattern has to be pretty battered for me to take the time to trace and cut out a copy. I'm going to add to the frazzled look of my pattern by using brown craft paper originally used to wrap art supplies. Waste not, want not. Today we will pattern the facings for the center front and center back. I'm going to break this into two posts because there are so many pictures. You will need your pattern, paper, tape, pencil, ruler, and scissors or an exacto knife. Everyone should be working with patterns that are at least 17 inches at the center back. If you are using shorter bones near the lacing then it can be shorter, but's it's worth double checking so you can make any alterations needed before patterning the back facing. Also, make certain all the notch marks are still there. Notches can be cut or papered over during pattern alterations so if some are missing add them back in. Lets' get started. Place the back pattern piece on a piece of paper and draw a line along the center back, a parallel line 1 1/2 inches from the center back, and one more parallel line 1 inch away. Flip the back piece over lining the center back against the center back line you drew. Trace the top and bottom curves. Draft one last line 1/2 inch from the center back line. Cut the piece out leaving extra at the top and bottom edges, then fold sides back along the lines. Flip the piece over and cut the top and bottom on the curve you traced. Transfer the notch marks to the new pattern piece. You should end up with something like this. Here is how everything will fit together when sewn. The back facing will be sewn to the center back. It's the one piece we've added seam allowance to on the pattern. So seam allowance isn't added again when the pattern is traced to fabric write a note right on the pattern. We won't add any seam allowance to the front facing either so you may want to note that on that piece. I did. Next we'll pattern the front facing and our the pattern will be complete. on the one were the corset busk at the 5 an center back. No same allowance? Hi Jo, you seem to have skipped the explanation of all those dotted lines during the tracing of boning channels post. I don't seem to have the same space as you between my dotted lines and the ones on your picture of center front facing with boning lines. Don't understand why (I end up with double the space needed for the busk and only 1/8 inch after last stitching line . I took a look at your image on flickr and think I've solved the issue. Take a look and let me know if it works. If the corset is being flat lined, can the back facing be skipped? Or will this make it weaker? I think I'm having corset anxiety lol. I'd still add the back facing. If you skip it the bones in the back will lie between the strong foundation layer and the weaker fashion layer and they could poke through the lighter fabric with wear. You don't want that after all your hard work!